WASHINGTON (CNS) — The Special Olympics, founded by Eunice Kennedy Shriver, turned 50 this year, with this year’s games held in Seattle. 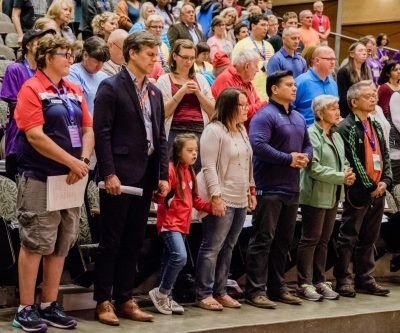 Not only were the games, held July 1-6, a success, Seattle Catholics are focusing now on how to leverage that success for its pastoral initiatives for Catholics with developmental disabilities. “Even though we’ve done a lot of great things, we’re just at the beginning,” said Erica Cohen Moore, director of the Archdiocese of Seattle’s Office of Discipleship. “This has given us the traction to move forward quickly with mental health issues. I feel, like the rest of the country, that we’re in a mental health epidemic” with rising suicide rates. “We’re also really, really trying to work on trying better to connect with our multicultural communities,” she added. This year’s Special Olympics USA Games had more than 4,000 athletes from around the U.S. competing in 14 Olympic-type team and individual sports. Understanding that Frannie would likely be born with Down syndrome, “we went into learning mode,” Ronan told Catholic News Service. “We already had a 9-year-old at the time, so we thought we knew what parenting was all about.” Not so, they found out. Moore and Sandra Barton Smith, assistant superintendent for Catholic identity and essential services for the Seattle Archdiocese’s Office for Catholic Schools, said inclusion has been a key part of the ministry of Archbishop J. Peter Sartain since his arrival in 2010. After winning a gold medal in the 2014 Special Olympics, Stephanie attended a Mass for Special Olympics athletes and their families celebrated by Archbishop Sartain. During the Mass that year, Stephanie gave the archbishop her gold medal, a unique gesture. The catechism was developed by Deacon Larry Sutton of the Diocese of Pittsburgh, who comes to Seattle twice a year to train teachers. The idea behind the Special Olympics got its start when Eunice Shriver, who had been advocating throughout much of the 1960s on behalf of those with intellectual disabilities, teamed up with Canadian physical education professor Frank Hayden on the need for those with disabilities to participate in athletic events. The first Special Olympics were held at Soldier Field in Chicago in July 1968 — just one month after the assassination of Eunice’s brother Bobby Kennedy, who was seeking the Democratic nomination for president. The concept caught on, and by 1993, other nations were hosting the Special Olympics World Games, with thousands of athletes participating in 32 summer and winter sports. Shriver’s son Timothy is now chair of the Special Olympics board of directors. “We’re working really hard to open our schools more intentionally to serve all learns. That’s the spectrum of learners,” from those deemed gifted and talented to those with profound disabilities, Smith said. “Special Olympics is looking into broadening its services to go beyond academics and get into robotics. We’re excited about that, because that’s the mission of church – bringing us all together as one,” Smith said.